Vitamins and minerals help to support a healthy immune system, promote the conversion of food into energy, support a healthy cardiovascular system, support strong bones, promote mental clarity, maintain normal metabolic functioning, promote healthy growth and repair of tissues, help maintain normal blood pressure and help maintain water and electrolyte balance in the body. There is no substitute for a healthy, well balanced diet; however, in today’s fast-paced lifestyles it is important to ensure the body is getting the fuel it needs. Antioxidants play a very important role in helping to maintain proper cardiovascular as well as lung function. Many opinions designate OPC’s (Oligomeric proanthocyanidins) as one of the strongest antioxidants on the market today. OPC is a combination of bilberry, grape seed, red wine and pine bark extracts, and citrus extract bioflavonoids, all found to be powerful antioxidants. OPC’S are bioflavonoids(complex organic plant compounds) found in fruits, vegetables and certain tree barks that provide exceptional nutritional benefits to the human body. Studies have shown OPC’S to be up to 20 times more powerful than vitamin C and 50 times more powerful than vitamin E, in neutralizing free radicals. The second most popular antioxidant is called Resveratrol, which is a natural antioxidant found in red wine. Poor cellular and cardiovascular health is becoming a worldwide epidemic. An unhealthy diet of processed, high-calorie, high fat foods, pollution, smoking and sedentary lifestyles all contribute to poor cell, heart and lung health. Scientists have revealed the “French Paradox”, which states that even though the French drink, smoke and eat high-fat foods, they have some of the lowest incidences of poor cardiovascular and cellular health. Scientists attribute this to the large amounts of red wine the French consume, or more importantly, an extract found in red wine, resveratrol. OPC and resveratrol are ingredients with incredible clinical research revealing it supports cardiovascular, lung and normal cell health. Because wine is so highly processed, the actual amount of resveratrol is quite low. One would have to drink at least three bottles of red wine per day to experience or equal what a resveratrol extract would provide. Grape Seed Extract is typically extracted from the seeds of red grapes(not white), which have a high content of compounds known as oligomeric proanthocyanidins (OPC’S). Grape seed extract is extremely rich in polyphenols, compounds in high antioxidant activity. Grape seed extract has been found to maintain healthy cholesterol levels. It should be noted that both OPC and Resveratrol should be taken in an ISOTONIC SOLUTION. Both supplements are available in powder form which is mixed with an exact amount of water in order to obtain this isotonic solution. Isotonic, which means “same pressure,” bears the same chemical resemblance of the body’s blood, plasma and tears. All fluids in the body have a certain concentration, referred to as osmotic pressure. The body’s common osmotic pressure, which is isotonic, allows a consistent maintenance of the body’s tissues. 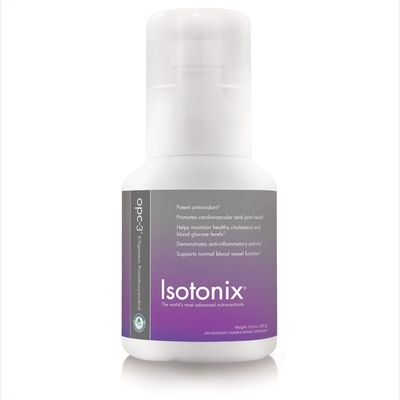 In order for a substance to be absorbed and used in the body’s metabolism, it must be in an isotonic state. Isotonic dietary supplements are delivered in an isotonic solution. This means the body has less work to do in order to obtain maximum absorption of the nutrients. The isotonic state of the suspension allows nutrients to pass directly into the small intestine and rapidly absorb into the bloodstream. With isotonic capable products, little nutritive value is lost, making the absorption of nutrients highly efficient while delivering maximum results through maximum absorption. Isotonic Resveratrol and OPC work to maintain cell health, promote normal cell cycle activity, promote apoptosis (programmed cell death) in un-healthy cells, support the normal activity of the Sirt-1 gene (involved in calorie restriction, fat mobilization, mitochondrial function), and promote cardiovascular health, by promoting healthy platelet activity, promoting vasorelaxation and providing antioxidant protection of LDL particles. This all results in greater efficiency of lung function and the removal of lung congestion that is associated with bronchitis. With this in mind it is easy to draw the conclusion that the addition of OPC and Resveratrol will enable the body to promote a greater atmosphere for it to repair the damaging effects of bronchitis. The two most important factors when searching for the best quality nutritional supplements are ABSORPTION and POTENCY. Istotonic nutritional supplements, when mixed with the proper amount of water, have the same PH and osmotic pressure as the body’s fluid. In order for meaningful absorption of nutritional content to take place, all food must be converted into an isotonic state. This process could take up to three hours. This time-consuming process limits the amount of nutrients absorbed by the body. Isotonic supplements set them self apart from other products on the market providing you with the maximum absorption of the nutrients within the product in the shortest amount of time.